I've never read novels on my iPhone before, only short stories. While waiting for my daughter one evening, I realized I'd left my Kindle at home. Oh well, I pulled out my phone and opened a file. Within minutes, I was lost. Gone. Engulfed. I'd become completely absorbed in a new world and its characters. That novel was Losing Logan. The fantastic cover made me choose it over everything else in my library. I'm so glad I did. High school senior Zoe was a fun character. There were times I wanted to slug her in the arm, other times I wanted to hug her. She was someone I liked and trusted--someone like my own girlfriend. She goes to the funeral of a fellow student, Logan, out of respect for what he used to be for her--a close friend. But Zoe has no idea that the Logan she finds standing in front of her is actually dead. She thinks he's pranking her and the entire community. Unfortunately, he isn't. He needs help and since she can see him, he looks to her for assistance. What begins as a simple case of waiting for the white light to appear turns into something more. So much more. What could have easily become a silly or trite YA story blossomed into a serious, occasionally dark, and haunting story of forgiveness, acceptance, and letting go, along with romance and murder. Helping Logan figure out what happened to him is an involved process, one Zoe never imagined would impact her so much. I love ghost stories and author Sherry D. Ficklin uses this idea as a springboard to inject humor, realism about life and the afterlife, while also handling other serious matters teens face. Zoe's full of snark, can be bitchy, but she's also incredibly loyal, funny, helpful--and I can't forget to mention-- entertaining. Chapter to chapter, my mind ran the wheel of emotions as I watched Zoe help Logan, fall for him, like his best friend, begin to get comfortable in her own skin, while also solving the mysterious murders. I haven't been this taken by a book about a ghost haunting someone in a long time. Bravo, Ms. Ficklin! 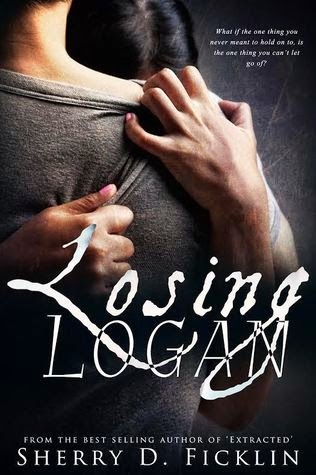 Wonderful characters, an intriguing story line and subplots, I fell in love with everything about Losing Logan. From the visually arresting cover, to the realistic characters and situations, to the tender, gorgeous love story between Zoe and Logan (the ending made me cry), I was captivated. As an avid reader of all things paranormal, Sherry D. Ficklin's engaging YA novel made me smile, sigh, and tear up. Books such as this make me--an adult with kids of my own--proud to say I love reading Young Adult books. This cover is what drew me to reading the synopsis. The despair conveyed in the clutching arms grabbed me and made me want to know more about the story. I'd say that's what any cover artist wants from readers. Visually striking. I'd pick this up in a heartbeat. I received a copy from the publisher. Thank you to Clean Teen Publishing.